When you first touch down in a new city, you might scoff if someone suggests you “hit up so-and-so food hall.” You’d be forgiven. The very words “food hall” conjure images of charmless college dorm cafeterias where you once shoveled cold chicken tenders into your mouth on a prepaid meal plan. But the next time you’re in Charleston -- or Austin, Dallas, Denver, Baltimore, Atlanta, DC, Birmingham, Long Beach, Huntington Beach, or Miami -- there’s a decent chance you’ll be pointed in the direction of a new food hall. Close to a dozen cities across the country have or will open their own versions by the end of this year. The new brand of food hall is neither a dorm cafeteria nor the mall food court of your youth. “If you’re visiting from out of town, and you want to get a flavor of a city, there’s absolutely nowhere better than a food hall,” Niall Hanley told me. Hanley is responsible for the Morgan Street Food Hall & Market, launching near Downtown Raleigh, North Carolina later this year. When doors open, visitors can sample local sushi, Asian fusion, and raw food restaurants in a single 22,000 square foot space. Also present will be Oak City Fish and Chips, a much-loved food truck known for its addictive seasoning on the fried seafood. If you’re prone to quick weekend trips, or a fan of eating really, really good food for not that much money, your ears should be perking up right now. Tuning into a city’s food scene usually involves an Uber, a 45+-minute wait, laying down a Benjamin, and repeating x3 until you go home. The whole idea of the food hall is to offer innovative concepts from aspiring chefs and big-name restaurateurs alike in an attractive, actually-well-lit space -- so you can dig into the local cuisine in less time, for less money. You may find a single leading chef holding court (literally, in the food court). That’ll be the case at Isabella’s Eatery in Washington, DC, a 10-restaurant space opening this fall (formerly the Tysons Galleria food court). Famed DC restaurateur and former-Top Chef Mike Isabella lets visitors try several of his destination restaurants without having to crisscross the city. The menus won’t be exactly the same, but if a diner wants to try the rigatoni with veal bolognese from Graffiato, a roasted duck phyllo pie from Kapnos, and wash it down with a chili-honey-pineapple margarita from Pepita, they can do it all in one place. And for less dough. So you can experience the best of the DC food scene and still have time to hit a Smithsonian. “A lot of chefs have pivoted from opening bigger, more expensive concepts to making nice food at lower prices,” said Michael Shemtov, who just opened the sleek food hall Workshop in Charleston, South Carolina. 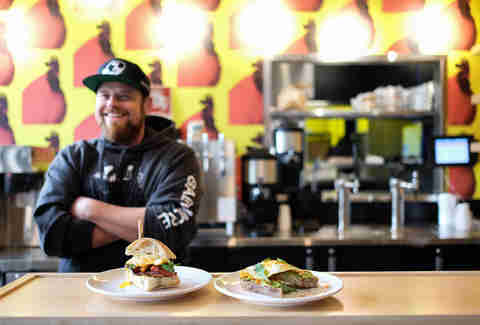 Shemtov’s also the guy behind Charleston’s late-night sandwich spot Butcher & Bee. His latest venture steers diners away from the elaborate, multi-hour restaurant experience in favor of fast-casual joints that don’t skimp on quality ingredients. 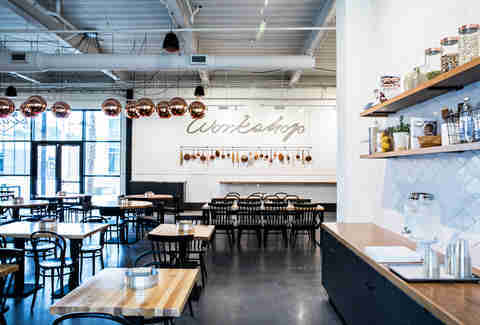 Workshop features six rotating kitchens. 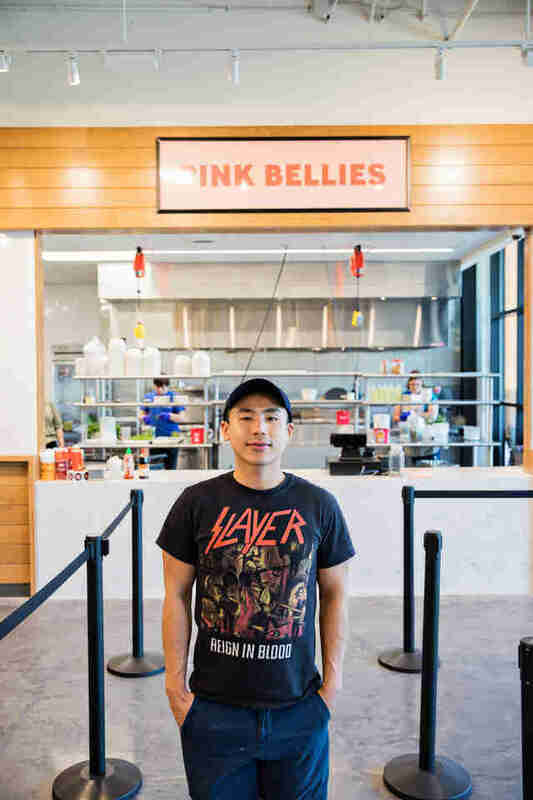 Current headliners include a grilled cheese shop from Butcher & Bee pastry chef Cynthia Wong and a surprising Tex-Mex concept from pitmaster John Lewis (aka, the brisket genius who helped Aaron Franklin open Franklin’s Barbecue in Austin). Pink Bellies, a Vietnamese food truck and one of our favorites in Charleston, is also here, along with the fan-favorite Animal Style Burger: a banh mi with two burger patties, American cheese, secret sauce, pickles, grilled onions, and mustard, crafted by owner Thai Phi. Food halls are prime for innovative and off-the-wall dishes; they give aspiring restaurateurs a chance to try out new concepts and refine their menus without risking their entire financial future by opening a brick-and-mortar. It’s also a logical next step for food trucks seeking a permanent location. That’s how Stenn Parton envisioned Lot 579, a food hall right on the Pacific Coast Highway in Huntington Beach, California. 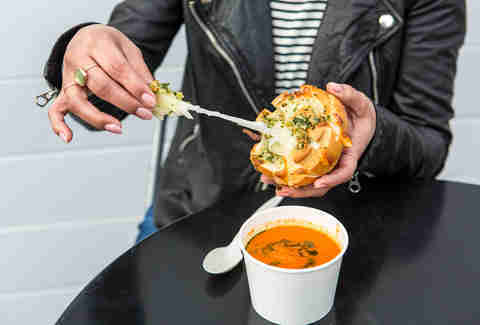 They courted the popular Burnt Truck, a roving Orange County food truck known for pioneering the grilled spaghetti sandwich, where pressed noodles are melded with marinara and mozzarella on grilled sourdough bread. The result is Burnt Crumbs, a perfect example of how food halls can give new talent a bigger audience. That means, not only are you sampling some of the best local cuisine, you’re conveniently doing it in a fun part of town -- or, a burgeoning neighborhood you might not otherwise visit. Lot 579 is smack on the water in Huntington Beach, and it has lured locals back to an area that had long been forfeited to tourists and dive bars. Raleigh’s Morgan Street sits between Downtown and Glenwood Avenue, arguably the fastest-growing part of the city. Baltimore’s R House is in Remington, one of the most creative neighborhoods in America today. And in cities like Miami and Birmingham, food halls are key chess pieces in the city’s revitalization efforts. Miami’s Central Fare will open its doors to a massively underserved residential population of 90,000 in a Downtown area that has virtually no food options after closing time. The hope is to mirror the success of Birmingham’s Pizitz Food Hall, which opened last year in an area the US Department of Agriculture classified as an official food desert. That “desert” is now home to Choza Taqueria, a runaway NYC hit that serves spicy chorizo and steak barbacoa tacos. 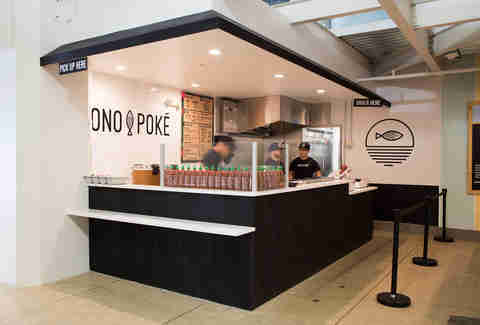 Ono Poke introduces Alabamians to poke via 25-year-old Vinh Tran, a Vietnamese native who could not have afforded a full-scale restaurant. And competitive barbecue champs Dan and Audrey Roberts are serving up artisan waffles, like the beef waffle dog and a peach cobbler waffle, at WaffleWorks. Draws like these have brought this formerly blighted section of Downtown Birmingham back to life, making it one of the most secretly awesome underappreciated cities in the US. The food hall trend, if you can call it that, isn’t brand-new. Manhattan’s Chelsea Market and San Francisco’s Ferry Building have been successfully stacking fast-casual joints into underused urban spaces for years. But increasingly other places are clearly catching on. As mid-sized cities look to become big-league destinations -- and improve their neighborhoods and local food scenes -- food halls will be major contributors. 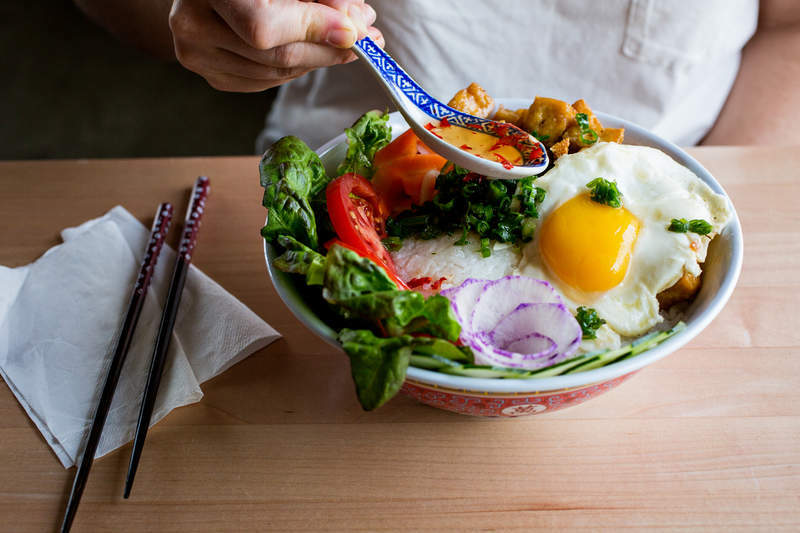 Hunt one down as a bona-fide travel destination the next time you step off a plane, hangry as hell.